The statistics are staggering on the failure rate of weight loss plans, especially plans that don’t include a mental component. 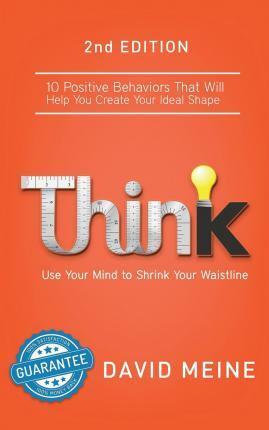 In Think: Use Your Mind to Shrink Your Waistline, author David Meine, specializing in weight loss, shows how a subconscious mind engaged in creating an ideal body shape plays a pivotal role in achieving long-term success in a weight loss program. Think: Use Your Mind to Shrink Your Waistline discusses the science behind the brain and why it can be so powerful, and it packs a toolbox filled with techniques to make your weight loss goal become a reality. It explains the ten behaviors that prevent you from losing weight and keeping it off, including -not getting a good night’s sleep; -eating and drinking too much sugar; -not drinking enough water; -allowing sabotage from yourself and others; and -not being able to “see” your future ideal body shape. Following real-life stories, Meine helps you understand how negative habits are formed and how you can change them at the deepest, most permanent levels of your subconscious mind using visualization exercises, one of the most popular new approaches to Brain Training for effective weight loss. He shows you how to get your brain “in the game” to achieve health, confidence, and the ideal shape you desire.